NOTE: COLOR SHADES ARE APPROXIMATE. ALL INFORMATION IS SUBJECT TO CHANGE WITHOUT NOTICE. The shingles on your new Bald Eagle building are a #1, A-Grade shingle. We do not use "seconds" with no warranty, like some manufacturers do. We get our 30 year Tamko Heritage shingles delivered directly from Tamko! We give you the choice of 7 attractive colors to choose from. We guarantee to give you the best quality for your money! The shingle roof option will add $200 to the cost of any wood building. Are you looking for the most durable roof on the market? Go with a METAL ROOF! We install your metal in a very professional way, utilizing the necessary trim pieces. We do not "cut corners" leaving off important trim pieces just to save expense like some manufacturers do! Prior to installing the metal roofing we install solid roof decking. Finally, we use the appropriate screws to attach the metal securely to the roof. Our customers deserve the best!! - 29 guage for durability: This will stand up to wind & hail much better than shingles. - impressive 40 year warranty: Not all metal roofing is created equal. We NEVER use seconds or blems!! - every color carries a Premier Energy Star Rating to save you money!!! - save money when ordering with a metal roof!! For more information on the metal roofing, click here! We encourage you to compare the quality and see the difference for yourself! Welcome to our many color choices! What would your life be like if you were color blind and could not enjoy colors? How drab life would be! Color in your life makes alot of difference, doesn't it? 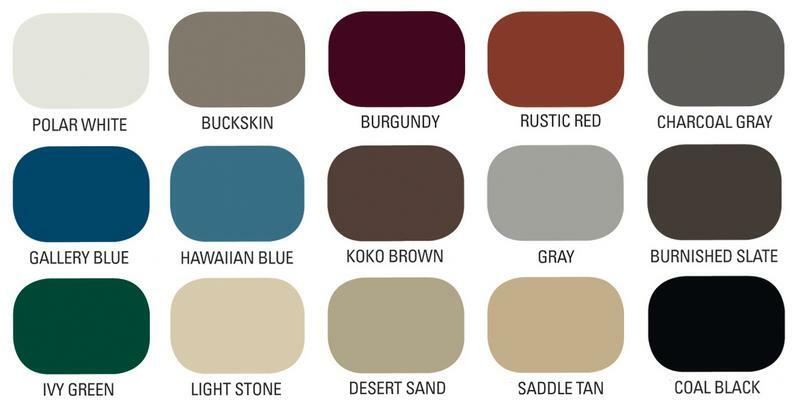 Our entire team here at Bald Eagle Barns is pleased to provide you with the colors you desire. Just like all the other components in a Bald Eagle building, we use only top quality paint from Sherwin Williams. We believe that a quality exterior, in a variety of colors is exactly what you are looking for. What's more, we are commited to giving you the most durable finish available. Much work goes into every building before it is ready for paint application. We manually caulk over every nail head and along the trim joints to completely seal the exterior. We then spray on 2 coats of paint creating a beautiful finished apperance. Our quality paint includes a mold and mildew resistant compound that will prevent mold and mildew from growing on your building! This is just one more way we bring you the finest product possible! Notice! All colors are available. However, Polar White, Rustic Red, Burnished Slate, and Ivy Green will be available for a much quicker delivery time than all the other colors.